This 1991 lodge offers peace and quiet and is wheelchair accessible. Great for walking or fossil hunting. Wildlife is plentiful. Hunting is great. Open all seasons. Oakwood Lodge offers western hospitality in a serene country setting. It is a oak log lodge on a 1,000-acre ranch. There are three guest rooms with private baths, great room, library, gazebo, deck and limited handicap access to main lodge. A hearty ranch breakfast is included with the room. The lodge is open all seasons and is adjacent to Custer Gallatin National Forest. Enjoy excellent hunting, wildlife viewing, hiking, fossil hunting, rock hounding and photography opportunities. Oakwood Lodge is located 25 miles west of Broadus or approximately midway between Ashland and Broadus. Between mile markers 84 and 85, turn south off Highway 212 and go 3.5 miles. 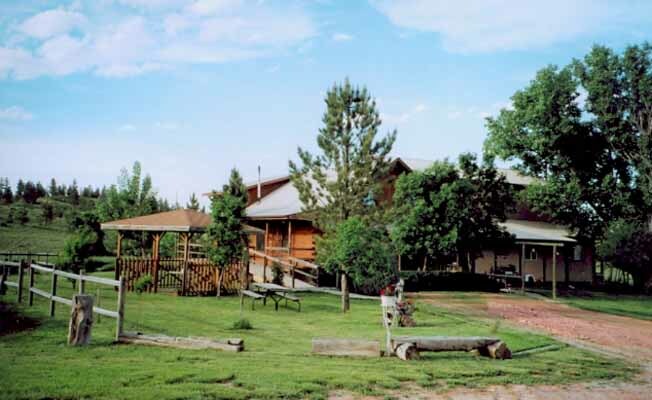 Approximately 150 miles east of Billings; 175 miles west of Rapid City, South Dakota.Oakwood Lodge is located 25 miles west of Broadus or approximately midway between Ashland and Broadus. Between mile markers 84 and 85, turn south off Highway 212 and go 3.5 miles. Approximately 150 miles east of Billings; 175 miles west of Rapid City, South Dakota.